We all travel, and when we do having the right gadget or tool can make it so much easier and relaxing. So, in honor of the season of giving, I wanted to share some of my favorite family travel gear and gift ideas. 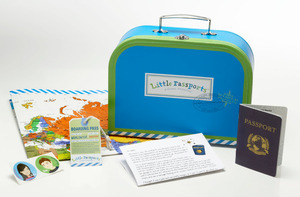 Little Passports allows you to share Sophia and Sam’s adventures around the world with your own kids, through geography, history, culture and language. You can purchase a subscription where every month you will receive a new suitcase of fun. You can choose to receive the World Edition or USA Edition. I think a big worry when traveling with small children is safety. Well, this kit will make your hotel room or condo safe and let Mom and Dad relax a bit. A great idea would be to have this shipped directly to your destination. It would be one less item to pack. I love this amazing new portable booster seat. 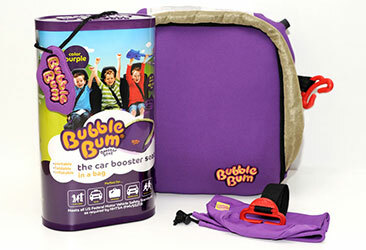 The Bubble Bum is so much easier to carry than having to lug around the big car seat. You can take it along to use in rental cars, taxi rides or even on a bus. 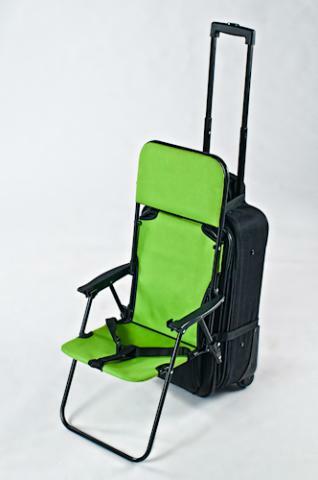 The seat is lightweight and compact, you can shove it in your carry-on bag and you are ready to go. When you are ready to use it you just blow it up. The seat is made for kids 4-11 years old, weighing 40-100 lbs. and up to 57″ inches. Melissa and Doug have made some fun and creative travel games. You can choose from Hangman,Memory and of course Travel Bingo and more. 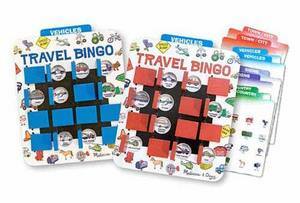 These games are easy to use and magnetic so there won’t be pieces all over the back seat. So, when it is time to put down the electronics, you can have some good old fashioned fun. I first saw this on Shark Tank. I love that show. When I saw this I thought what a GREAT idea and so simple. I also like that it is easy to use and compact. It makes navigating the airport so much easier, when you have the little one strapped in to the seat. I have a friend whose sister is a flight attendant, she swears by it. This series is a great way to travel and explore with your kids. 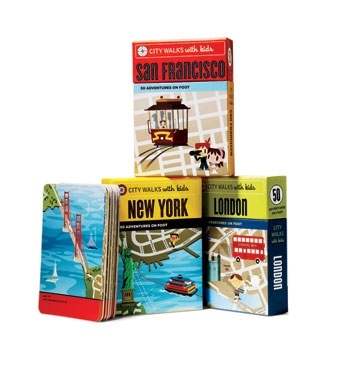 Each city set has cards that provide family friendly walks to explore the city. Along each walk you are given suggestions of places to see and explore along with kid friendly restaurants to take a break and grab a bite to eat. Each set has 50 cards along with a master fold-out map. You can find sets for New York City, London, Paris, Washington DC and San Francisco. 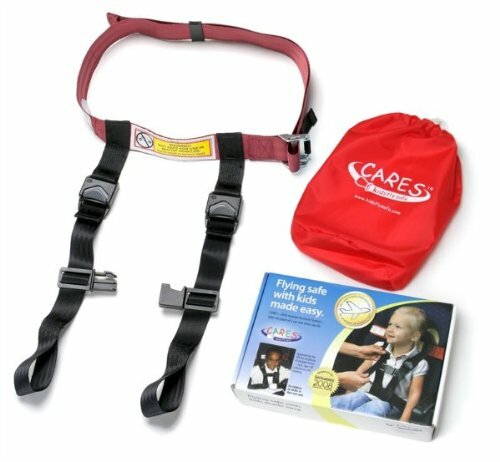 The CARES restraint is the only FAA certified child harness that can be used in place of a car seat. It’s perfect for toddlers who need their own seat, but aren’t secure enough with the regular lap belt. It is so much easier than having to lug your car seat. Also, I had a friend bring a car seat and was told by the flight attendant that is was missing a “safety sticker”, so she was stuck with just a lap belt. 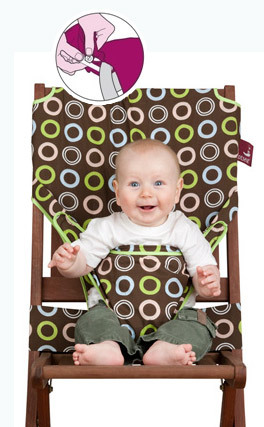 The Tot Seat is known as the “washable, squashable travel highchair”. Tot Seat’s special design allows it to be adjusted to fit most any chair. It will fit snugly and safely supporting your child so they do not slip out. As well, they offer the seat in many fun, colors and designs. When I fly I always bring my neck pillow from Brookstone. I may not look cool, but I am so comfortable. 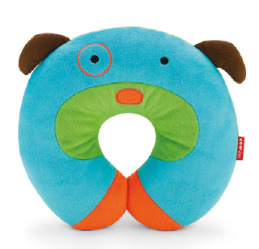 So when I saw these Skip Hop neck pillows, I fell in love. The kids can rest easy and look cute, too. Also, Skip Hop has super cute and durable, rolling backpacks, travel blankets and more. I hope you find this list helpful. As well, good luck with your holiday shopping. If you have any great travel gear or gifts to share please let me know in comments below. Kimberly Milnes, is a mother of 2 boys and owner of Adventures By Kim. She is a Family Travel Expert and professional sharing family travel tips, and information as well as helping families plan amazing and hassle free family vacations. Please feel free to contact her at [email protected] or www.adventuresbykim.com. 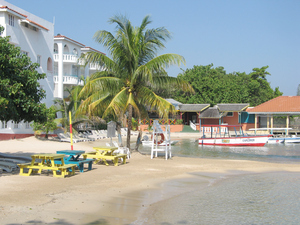 The Franklyn D. Resort and Spa in Jamaica is an all-suite, all-inclusive family resort. The resort was recently awarded a 2012 TripAdvisor Traveler’s Choice award for the The Top 25 Hotels & Motels for Families and Top 25 Hotels for families in the Caribbean. In doing my research to find the best resorts for families, I really liked what I had read about this resort. 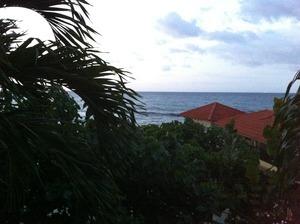 So since I was going to be in Jamaica I wanted to check it out for myself. I like to have a first hand experience of the properties that I recommend to my families. I feel the best value the resort offers is their Vacation Nanny service. Upon arrival each family is assigned their own Vacation Nanny. 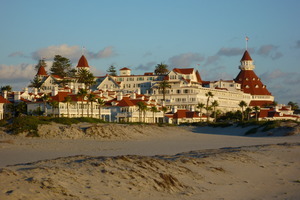 The nannies are with families from 8 am – 4 pm every day. Your nanny is there to care and entertain your children, help keep your suite clean and help with arranging any activities or excursions for your family. 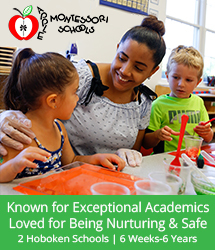 All nannies are professionally trained and CPR certified. The nannies are also available at night for a small hourly fee, so Mom and Dad can have a nice date night. 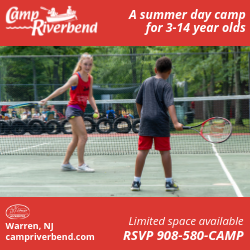 Along with having a nanny to help with the little ones, there is also the Yellow Bird Kids Club to make sure there is something to do for all ages. 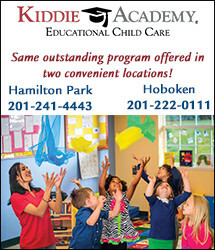 They offer plenty of age appropriate activities, computers, video games, crafts and more. There is also a special area for Teens. 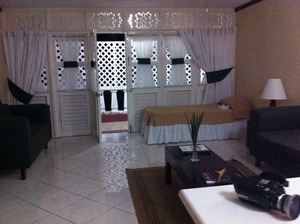 The rooms are spacious and very clean. Since this is an all-suite resort every room has a kitchen, separate living room and bedrooms. It is nice to have room for the family to spread out. They will make sure to stock your refrigerator with water, juice and snacks since this is an all-inclusive resort. The resort has a very nice beach, pool and a great water slide that the kids will love. There is also a small kiddie pool for the little ones. 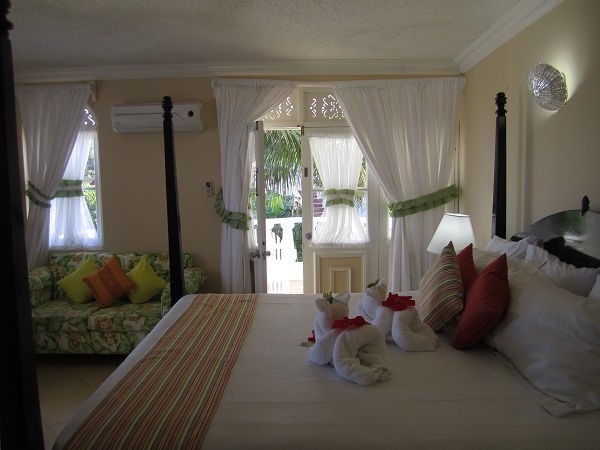 Overall, The Franklyn D. Resort and Spa is great resort for families. Even more, I think it is a great value. I know families with kids under 3 find it hard to get away. Especially, since those little ones can not get in to most Kids Clubs. 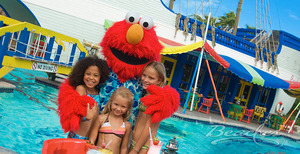 However, this resort makes it a little easier since you will have your own vacation nanny, which is included. Just having someone to help will give Mom a chance to relax and be able to get a “vacation” as well. Please follow me on Twitter and check out my Facebook page to make sure you get the latest news, tips and just what is going on at Adventures By Kim. When visiting a new city like New York, Paris or Rome there are those famous attractions that most of us are going to want to visit. It may be “touristy”, but most of us want to see the Empire State Building, Eiffel Tower or the Sistine Chapel. However, we don’t want to have to wait in the long lines. Well, with the power of the internet you can book your tickets in advance and “skip the line”. As well, you might even be able to save some money, too. There are many sites that exist today, which will allow you to book your attraction, concert and museum tickets in advance. When I traveled to Italy several years ago, I purchased all my museum tickets in advance. I was able to go on my designated day, ticket in hand and bypass the long lines snaking around the building. I have to say it is so nice to see a long line and know you don’t have to be a part of it. 1. Visit the official website for the attraction or museum you want to visit. You will see ticket prices, as well as available times to visit during your stay. 2. Visit the official site for the actual city you are visiting. The site will be a great resource of ticket vendors, links to the websites for the attractions and more. 3. Viator is a trustworthy site to purchase tickets in advance. They work with tour operators and attractions to offer tickets at a decent price. 4. Remember, that even though you are skipping the main line, you will still have to go through security which can have a line in the high season. 5. Work with your Travel Professional to coordinate an itinerary and get the tickets you want. As well, a Travel Professional has access to certain ticket and tour suppliers that do not work with the public. 6. Check out the city pass for your destination. 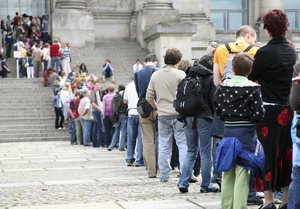 Like The Paris Pass, for one price you can get entry in to many museums and attractions. 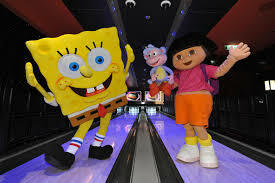 However, you need to make sure they are offering the attractions you want to visit. 7. If you are traveling to Europe, visit Rail Europe where you can get tickets that will include your train ticket as well as a ticket for the attraction. season, example November – March. 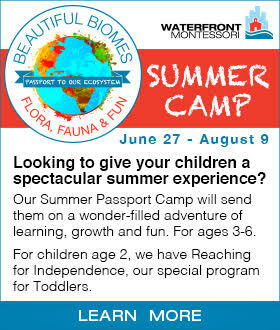 So, with a little planning you can save time and money on your next family trip. 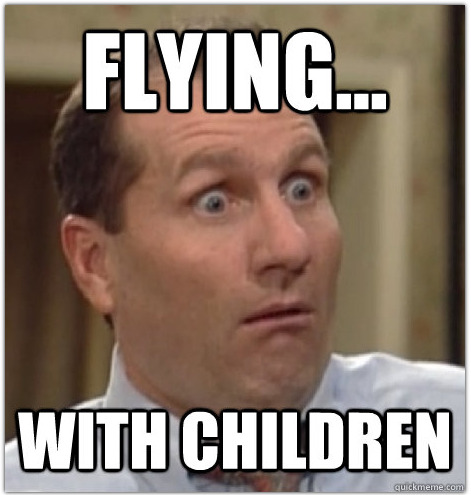 Yes, it is that look of fear and dread that takes over most parents when they think of flying with their kids. 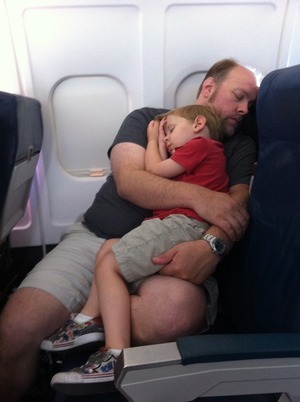 I hate to see families forgoing vacations, just for fear of what will happen when flying with their kids. Really, it does not have to be that bad. But, as I have said before, being prepared is half the battle. So to go along my article last week on family friendly airlines, I wanted to share some of my top tips to take the hassle, fear and stress out of flying. 1. Make sure to check in online 24 hours in advance, as well as double check your seat assignments. I know some airlines will as if you want to check in for your return flight as well, I say NO. I did this recently and even though I had booked seats in advance and double checked on the way out, the airline changed my seat on the return flight. 2. Give yourself plenty of time at the airport. Security lines seem to be longer and longer lately. Make sure you have enough time to check bags, get through security and get to the gate. 3. If the airport is busy, check your bags at the curb. For the small tip, it saves waiting in line and having to drag your bags and family through the airport. 4. Bring your stroller to the plane to fold and check at the gate. It will be waiting for you when you get off the plane. It is much easier navigating the airport if you have the kids “secured” in the stroller. 5. Check the TSA Rules on liquids for kids, you are allowed extra allowance for formula, juice etc. Here is a link to a great TSA blog which addresses traveling through the airport with children. 6. Remember kids 12 and under do not have to remove their shoes when going through security. 7. Most airlines no longer offer milk on board. Make sure to have enough with you in case there is a delay. 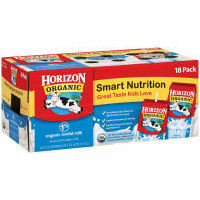 As well, a shelf stable milk like Parmalat or Horizon, is a good choice. 8. Most airlines will check strollers and car seats for FREE if you are not bringing on board the plane. 9. Pack extra “everything” in your carry-on bag. Make sure you have enough diapers, snacks, extra clothes just in case of delay. Check out my Busy Mom’s Vacation Planning Kit for my Airplane Survival Packing List. 10. Entertainment, Entertainment, Enterainment!! Make sure you have books, toys, DVD player, crayons/makers, etc. Lots of different items to keep them entertained. As well, go to the dollar store and have an emergency stash of “new” toys or such to pull out in a meltdown emergency. 11. Make sure you speak to the airline before bringing a car seat on the plane. Not all car seats are allowed. As well, in the end it is up to the flight attendant if you are allowed to use it. 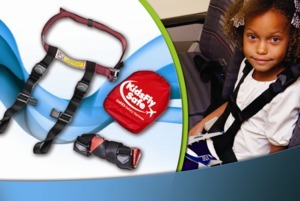 Also, check out the other FAA approved child restraints, like Kids Fly Safe. 12. Prepare the ears of little ones for take-off and landing. For babies, you can nurse or give them a bottle. Toddlers suckers, sippies or even gum are good options. 13. When my boys were little I would bring Starbucks’s gift cards to hand out to my seat neighbors just in case of meltdown’s. 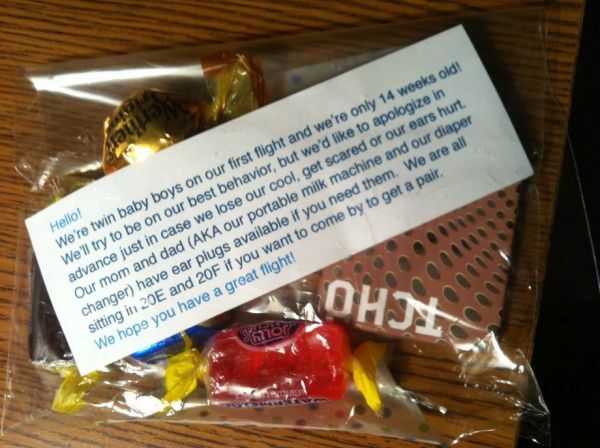 I loved this idea from some new parents. 14. While some airlines will let you pre-board, I say wait as long as possible to board the plane. Let the little ones run around, get a last potty stop, basically wear them out. If you are on Southwest, you will want to get on as soon as possible to make sure you have seats together. 15. If you have a favorite airline make sure to sign up for emails and follow them on twitter to get sales not advertised to the general public. 16. If you have more than 1 airport close to you make sure to check prices from the other airports. You might have to drive a bit longer, but you might save a bundle. So, like the Boy Scouts flying is all about “being prepared”. If you are prepared at least you will have the tools to try to fix the situation. Are They Really The Family-Friendly Skies? As I have said in the past, I think flying with kids is one of the biggest hurdles to overcome when planning and actually going on vacation. No one wants to be “that family” on the flight. But, I think if you are well prepared you have won half the battle. I have written several blogs in the past on some of the issues I see families facing when it comes to flying, like getting seats together and getting the best price on your tickets. The holiday season is fast approaching and I know many of you will be flying to your destinations so I wanted to share information on the different the carriers and the amenities they offer to families. Jet Blue is one of my favorite airlines for families. A big reason is FREE checked 1st bag, for a family of 4 that means saving up to $200 on a trip. As well, more leg room and seatback televisions which offer 36 channels of FREE Direct TV. As well, they actually still serve kid-friendly snacks, like animal crackers at no extra charge. Now, they also offer Family Pooling of your True Blue points. A great way to save and maybe actually use your miles. Also you can check your stroller at the gate and they offer pre-boarding with children 2 and under. Make sure to check out the FREE Soar with Reading Activity Kit. My boys have even received a set of JetBlue Wings, so make sure to ask for them. Southwest also offers a FREE 1st checked bag, so again a family can save on this airline. As well, they offer a discounted fare for infants, which is nice if you don’t want to have to hold the baby the entire flight. Southwest does not offer assigned seats, which can be an issue with families, however if you have kids 4 and under you are automatically in the second boarding group. Make sure to ask for coloring books and a set of Southwest Wings. Another great airline which offers amazing amenities and service. There is a $25 bag fee for non-refundable tickets only. They offer seatback entertainment with FREE satellite TV, games and even seat-to-seat chat. I loved that I could order food or drinks directly from my seat. 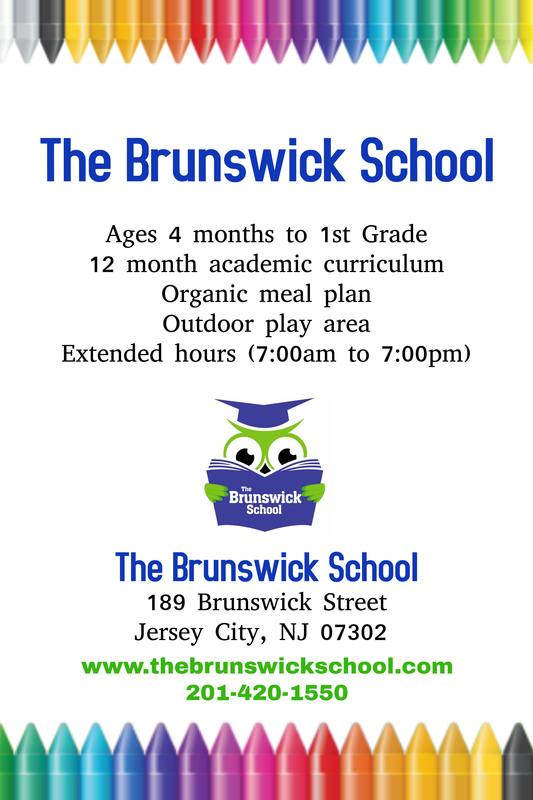 They also offer kid friendly meals like, PBJ and organic gummi bears for $4. Also, families with “small children” can pre-board. 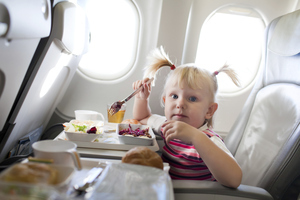 They do not offer pre-boarding, but they do offer kid-friendly snacks and meals to purchase on board. Also most planes are now equipped with wi-fi. As well you can check your stroller at the gate, if it is collapsible and weighs less than 20lbs. They do offer pre-boarding for all families, even before first and business class. As well, they offer kid friendly meals like PBJ and fruit for purchase on board. Flights with seatback screens offer FREE satellite television as well as on demand movies and TV shows for a small fee. Delta also now offers the Smart Travel Pack which for a fee ($199 until 1/14/14) you receive: 1 Free checked bag, priority boarding, preferred seats, Economy Comfort and 20% additional miles. It really is a good deal. United no longer offers pre-boarding for families. However, they have been upgrading their planes and are now offering wi-fi as well as seatback set with more than 100 channels of live programming. As well, they do have snack boxes which you can purchase on board. Overall, I think we have all seen how the domestic airlines seem to be taking away amenities and trying to charge “fees” where they can. However, if you can fly on an International carrier like Luftansa you will quickly see how much more civilized the flying experience can really be. Heck, one airline even offer Sky Nannies. But since most of us are flying the above carriers. if you are prepared it really does not have to be a bad experience. I have been flying with my boys since they were small, so now at 4 and 7 they enjoy flying. 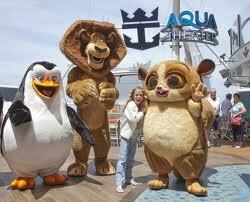 I think a cruise is a GREAT vacation choice for families. First, they are a great value. You have your food, activities and room all included in the price. As well, you and the family can explore more than one destination and unpack only one time. Even more, a cruise can offer something for everyone in the family; great kids clubs, babysitting, pools and water slides, great destinations, adult only areas and more. 1. I am afraid of the Balcony. Yes, the balcony can be a scary option for families with small children, but there are some roomy cabin options without a balcony. Norwegian has Family Ocean View cabins that are spacious and include a large porthole so you don’t feel like you are living in a cave. As well, Disney has cabins with large portholes, they big enough sit in to read a book or just watch the ocean pass by. As well, Disney has Inside cabins with the Magic Porthole. These inside cabins are surprisingly large and with the Magic Porthole, you are getting a live feed of the outside of the ship, along with some surprise friends. 2. Will there be enough room for the family? 3. What about a hurricane or bad weather? 4. How do I pack for a cruise, especially if I am traveling with a baby? When cruising you have to check your bags before you board the ship and they are delivered to your cabin, which sometimes can take a few hours. So make sure you have a carry on bag with anything you might before your bags arrive. 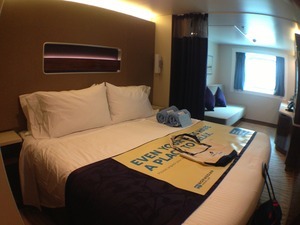 As well, pack swim suits in your carry on because if you get on the ship early your room might not be ready. 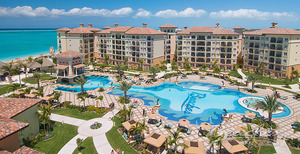 But you will be able to get something to eat, enjoy the pool and get your vacation started. As well, most ships have an onboard laundry facility, so if you want to pack light you can do laundry to make it through the vacation. Also ships with a nursery will have baby toys, high chairs, and anything else you might need for a baby. 5. What if I run out of diapers, formula, etc.? 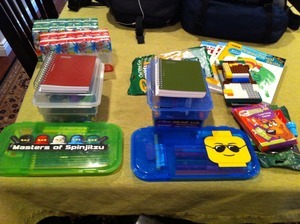 I know when traveling with little ones it can be daunting thinking of all the supplies you will need. Also, what if you run out of something while at sea. Most ships have baby supplies available in the shops. As well, there are companies likeBabies Travel Liteor Babies 2 Go where you can order supplies in advance and have them delivered directly to the ship. 6. My child is not old enough for the Kids Club. 7. What if we get bored on the ship? Really if you compare to a land vacation, a cruise can be a GREAT value. The cruise lines are always having promotions and for my clients even after they are booked I am looking for free upgrades, onboard credit and more. As well, for those near a port, you could save over $1000 on not having to fly to the destination. As well, if you look at all that is included in a cruise it can be a great savings. 9. What if we all get sea sick? 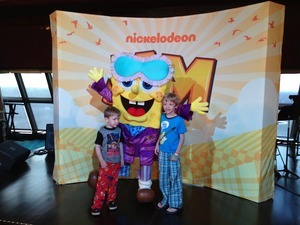 My kids have been on 3 cruises and have never had a problem with motion sickness. These newer ships have stabilizers and unless there is a storm you are not feeling the motion. However, I never travel without my “patch”. I put it on before we board and I am good to go. There are pressure bands and other remedies, but I think the patch really works the best. There are so many options of where to sail on a cruise. Of course, you can visit the Caribbean, but you can also visit Alaska, Panama Canal, Hawaii, Europe and more. 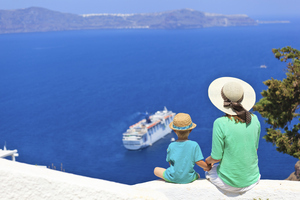 Especially with a family, cruising can make visiting locations like Europe so easy. I think it is a great way to introduce your kids to Europe. Once on the ship you unpack, relax and visit, Span, Italy, Greece, France and more. No packing and unpacking, schlepping bags, kids, etc. During the day you visit the city, at night you relax and enjoy the ship and the next day you are at a new destination. So easy. 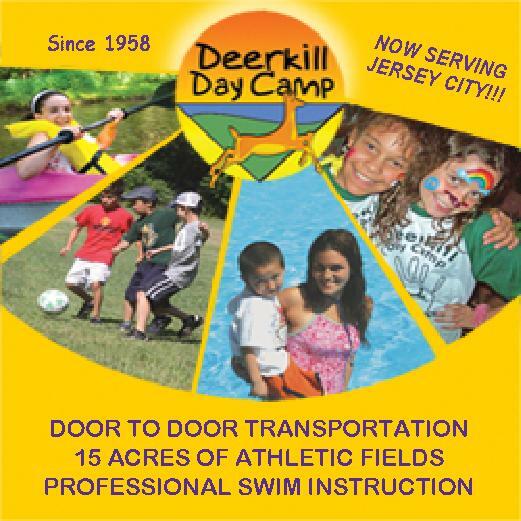 For those of you here in the NY/NJ area we have some GREAT options for cruising. We have the new Norwegian Breakaway sailing from NYC to either Bermuda or Florida/Bahamas. On the Florida/Bahamas, you can spend the day at Walt Disney World and Atlantis. I call that 3 Vacations in 1 and you don’t have to fly. Next November 2014, we will have another amazing ship, Royal Caribbean Quantum of the Seas sailing out of Cape Liberty, NJ. This ship is amazing. You will be able to ride bumper cars, “sky dive”, zip line and more. While we were on our cruise a few weeks ago, I was again reminded how hard it is to stay connected while on a cruise. You really are limited in how you can connect with the world. We spent over $100 on internet/wi-fi access on the ship for the week. It is CRAZY!! In Bermuda, we were able to get access for $3 for an hour, but you had to hang by the shop that sold the time. A better option, but still not great. I have always recommended that when traveling outside the country that you call your provider to add an International plan to your phone. It can cost as little as $30 for a 1 month plan. You also need to make sure it includes data and roaming as well. Believe me that is ALOT cheaper than paying for International calls and roaming. When I am traveling outside the country, I usually turn off my cellular as well as data and roaming, then a few times a day turn it on and get my email “pushed” to my phone. The best, is if you can find a free wi-fi spot. So this week I wanted to share with you some of the apps and plans that are out there to help you stay connected while you are away and not have to spend a FORTUNE. 1. Wi-Fi Finder This is a MUST have free app. The app points users to over 650,000 wi-fi locations in over 114 countries. The app has an online and an offline function. The offline allows you to download their most up-to-date database, just in case. 2. Whatsapp I first learned about this app from a fellow travel agent and she swears by it. This app is a mobile messaging app which allows you to exchange messages without having to pay for SMS (text messages). It is available for most smart phones. As well as you can send messages to ALL phones. It uses the data plan you use for email and web browsing, so it does not cost you extra to send text messages. You can also send images, video and audio messages. 3. Viber This program allows users to call, text and share pictures FREE over 3G and wi-fi to other Viber users. The other nice thing is that you don’t have to register to use this program. As well you can use Viber with windows and mac computers. 4. Gmail SMS (Texting) If you have a gmail account you can send and receive free text messages. So if you can access your account, you can send a text. It is a great way to save money. If someone responds to your text it will appear in a chat window. It is also saved. 5. Skype Mobile This app is supported on just about all smart phones. All phones with the app allow face to face video calls and instant messaging over 3G or Wifi connections. Android phones can also send photos, videos and files for free. Windows phones can send and receive free instant messages. Also all phones can make low cost calls, for around .21 cents a minute. Much cheaper than a standard per minute cell charge when roaming. 6. XCOM Global MiFi – This company offers mifi hotspots which you can rent for your trip. They charge one flat rate per day. You would never have to hunt for wi-fi again. You can use this with one of the other apps I have suggested. You can order from their site, they send you everything you need in a handy travel pouch and provide the envelope with pre-paid shipping for easy return. 7. Rent a SIM Can You can rent a SIM card with a pre-loaded plan and you will be ready to go. The research I read is that you really should have a plan that allows at least 100mb a day. KeepGo is the one I would use. The SIM card will allow you to stay connected just like at home. You tell them your travel dates, where you want to go and the plan you want and they will give you a quote. They send you a card and you do not have to return. 8. AT&T Global Messaging You can choose a plan which allows you 50, 200 or 600. This plan starts for as little as $10 a month. All of these plans require you to purchase 1 month of service. These plans allow you to send text, picture or video messages while you are traveling in over 150 countries. It is a great way to stay connected to friends and family. 9. AT&T International Call and Roaming This plan is a must add-on if you know you will need to call while you are away. Plans start for $30 for 80 minutes. There is also a 200 and 500 minute plan. It is good to purchase more than you think you will need as the overage cost can break the bank. Also, there are separate plans for Mexico/Caribbean and Europe. AT&T Cruise Ship Calling, Messaging and Data: Offers 50 minutes of talk time, 100 text, picture or video messages sent, as well as 100 MB of data for $120/month. I hope you find this information helpful to helping you stay connected while away and not have to spend a fortune to do so. My boys are constantly taking my iphone or ipad and leaving it somewhere. Usually, somewhere I can’t find it and of course they do not remember where they put it. I will usually use the Find My Iphone app to track it down. But, I recently discovered something even better , hipKey. However even better than using it to just find your iphone or ipad, you can use it to find your child, purse or other valuable. I will be the first to admit there are have been a few times where I was panic stricken thinking my child was missing. I wish had hipKey, then I could have pressed a button or the alarm would have gone off and I would have easily found him. hipKey is a lightweight and easy to use device. You just download the app and attach hipKey to the valuable you want to keep track of, like your child, purse, or other valuable and you are ready to go. The alarm will go off if you forget your iPhone or iPad or if someone attempts to steal it. 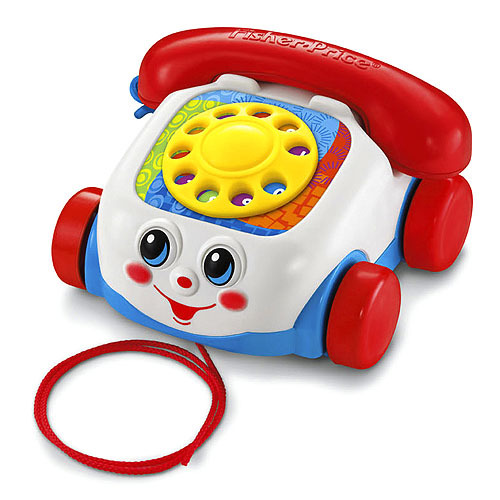 The alarm will alert you if your child wanders too far away, or you can push the alarm as well. So if you are out at the mall or on vacation, if your child strays more than 164 Feet the alarm will sound and you can quickly locate your little one. As well, I really like that you can adjust the distance range to short, medium or long. Also in Child Mode, you can take a photo of your child. This means you will have a photo of what your child is wearing and looks like on that day. Attach the hipKey to a bag and the alarm will go off if someone moves it. hipKey is available for $89.95 through the Apple Store only for now. It is has a rechargeable battery that lasts 2-4 weeks between charging. As well it is easy to set up and use with the hipKey App. I have to say while I think it is a great way to keep track of your purse, keys, etc. for me as a Mom I will be using it for the Child Mode. I love being able to have that extra peace of mind when I am out with the boys. OK, I know you are going to pack clothes, shoes, underwear and all that FUN stuff for your next family vacation. But, if you need help to remember the basics, you can sign up for my Busy Mom’s Vacation Planning Kit and you will receive my ULTIMATE packing list. However, there are those items you might need in a pinch, or that you do not think to pack in advance. You know those “rainy day” items or items that just make your trip easier. So here is my list to help. If you have any items you always pack that I missed, please share them below. 1. Zip Lock Bags Zip Lock bags are great for wet or dirty clothes, as well as all those shells or rocks you might want to bring back. Also, I like to pack any liquids or items that might spill in zip lock bags as well. 2. Photocopies I think it is important to have copies of all your travel documents, as well as your drivers license, passport, insurance card and credit cards, especially if you are traveling outside the US. Make sure you have copies of the front and back of your cards. Take pictures on your smartphone, as well have some good old fashioned paper copies. 3. Extra Battery or Charger Take a look at all the electronics you are bringing and make sure you have batteries, cords and/or a charger for each item. I love the PowerTrip, because it has USB port, you can plug it in to charge, as well you can charge it with best power source, the sun. 4. First Aid Kit When traveling with kids it is important to be ready for any sniffle, cut or upset tummy. Along with band-aids and neosporin, I always pack Benadryl, a fever reducer, ear drops, and gas relief. Also, if you or your child are taking any prescription medication, make sure to get an extra prescription to bring along just in case you need to get a refill while away. 5. Shout Wipes or Tide Stick If my kids don’t spill something on me, I can usually count on them spilling something on themselves. 6. Child Proof Materials We as parents are so good about childproofing our homes, we sometimes forget we need to do the same when we travel. I have recommended before the Travel Tot Childproofing Kit which has everything you might need. As well, a roll of duct tape can do the job. You can put the tape over outlets, easily. 7. Night Light If your kids use one at home, then it is a good idea to bring one on your travels as well. It helps everyone navigate their way to the bathroom at night in unfamiliar surroundings. I have banged my toes a few times trying to make my way around a dark hotel room at night. 8. Water Bottle Traveling with your own water bottle is a great way to save money. As well you can get a bottle with a built in filter. I like the Water Bobble. They come in 3 different sizes and the filter lasts a long time. If you get tired of water, I also suggest bringing some flavor packets, like Crystal Light. 9. Safety Pins I like to have a few different sizes in my travel bag. This is a do-all helper to either attach items together, fix a hem or more. 10. Tote Bag I am not talking a big bulky bag, but those great folded, rolled or collapsible bags that you can stuff in a pocket. It is great for souvenirs, toys or a picnic lunch. It is nice to have it when you need it. **Extra – Photo of Luggage Contents – This is “just in case”. If for some reason the airline loses your luggage or something is stolen you will have proof to help with your claim. As well to make sure you are compensated accordingly.